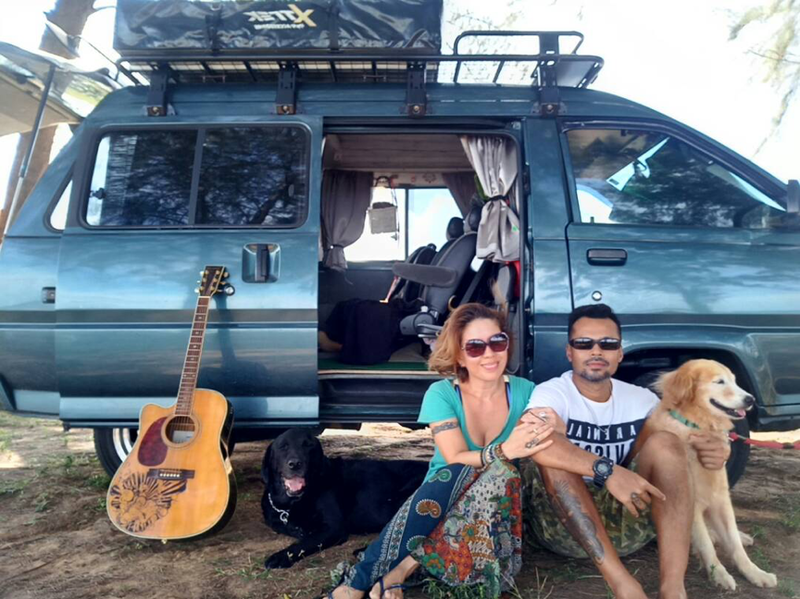 Our friends, the 24H Travellers, share with us how they got started on this journey on wheels, driving overland from Malaysia to the UK. 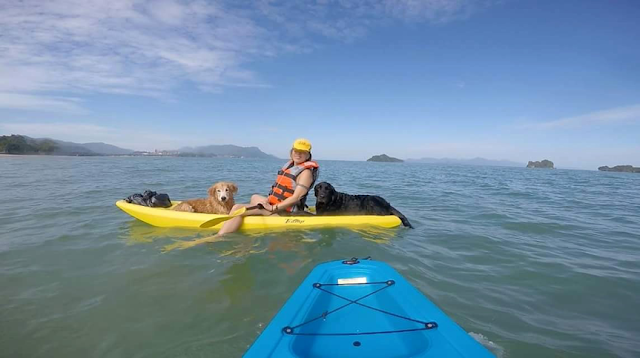 Left to right – Bo, Sam, Rene, Roxy. Sam here, and Rene has been my partner since the day we first met in 1997. We ran the hamster wheel together up to 2017 and decided it was time to jump off and take a moment to analyse what exactly we wanted out of our life. When we first met, we had just one car and nothing else but our dreams of building a life together. As we built our lives, we began accumulating so much stuff! A couple of fully furnished properties, land, a warehouse full of clothes, an office and a studio, salaries and pay rolls, bills and mortgages…the whole shebang. We would be off to work in the morning and back from work in the evening, vacation trips in between many months of hard work…you know – the normal life we all go through. I don’t claim that it was a bad one; if we didn’t hustle back then, we wouldn’t be able to make this drastic change now. I wasn’t happy and I think as I look back now, nor was Rene. But we were doing what we had to do, which is going through the motions of work for more money to buy more stuff, and keep on working to maintain the stuff we had bought. Every eight years or so, Rene and I would go through a major change in our careers. It was inevitable that life for us was about to change once again. It happened on the day I asked Rene a question: if I were no longer in his life, what exactly would he do? His answer was what changed our lives forever. Rene said, “I would just pack up my bags, pick up my guitar and travel full time.” That was exactly what I would do too! So why don’t we do just that then? We had too much stuff, that’s why! We started to sell everything we owned and although we are still in the midst of selling, our journey has begun. We sold one of our cars in order to buy a van, and self-converted it into a tiny campervan and began travelling with our dogs, Roxy and Bo. 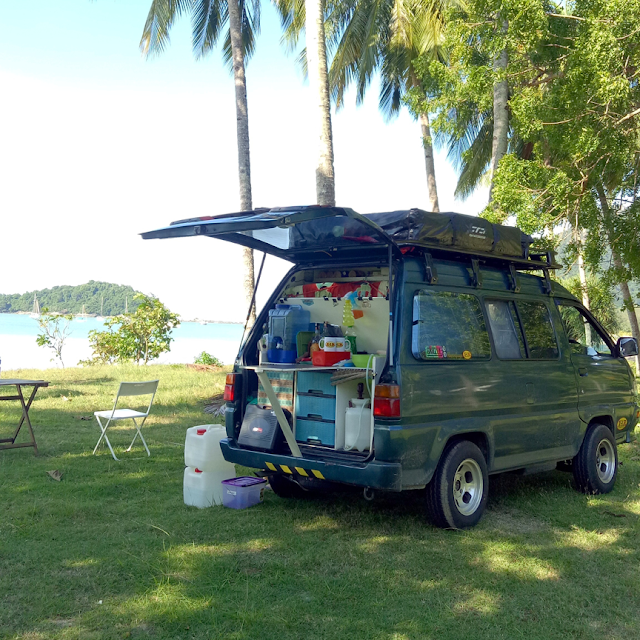 To get used to this new change, we decided to start our travels within Malaysia, with an end goal of one day driving overland from Malaysia to the UK. I was a photographer and Rene was a composer. We diluted our companies and built ourselves a YouTube Channel and a website to house our new adventure. We named ourselves the 24 Hour Travellers because that was the goal we set—we were going to be full time travellers. 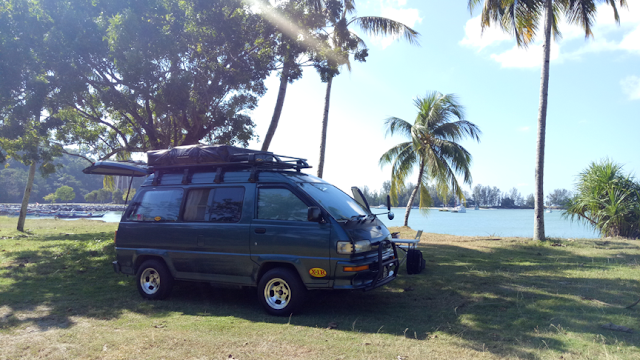 Langkawi. Office for the day. Obviously we needed to plan this out well. One thing we knew for sure, we were not going to wait for retirement in order to travel. So where would the money to sustain our lifestyle change come from? Savings would eventually run out and we would end up at the bottom of the hill again, but at age 50 if we weren’t careful! That’s where we are at now. 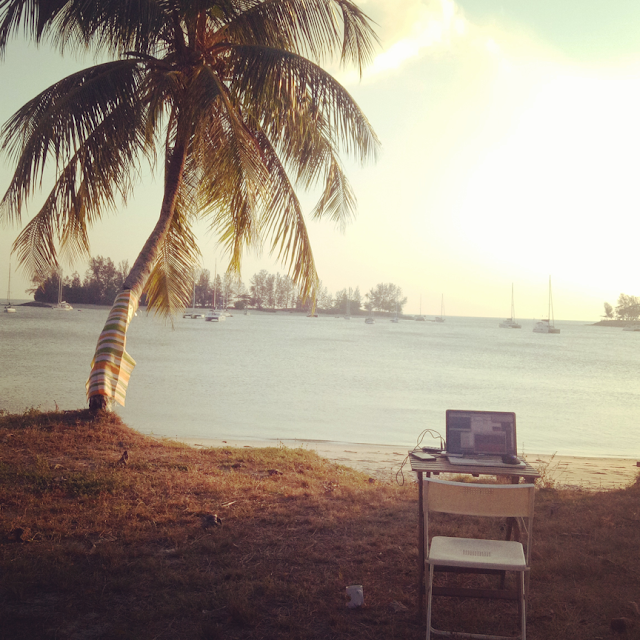 There’s no set path to sustain full-time travel for us. It’s a combination of many things that we do to hustle towards our quest for the simple life on wheels. We have learned to live with less and as we continue to simplify our lives, we hope to share our experiences through the platforms in which we have worked so hard to build. If you want to know more about Campervan Travel and Van Builds, head on over to our YouTube Channel (links at the end of this article). 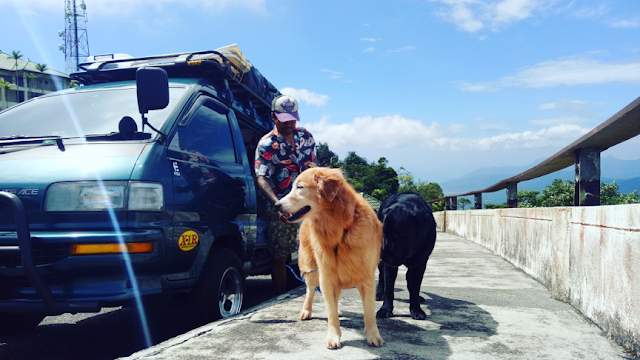 In the next part, we will talk about what it is like travelling with dogs in Malaysia.